I don’t use my kitchen shears for absolutely everything – for that matter, I often don’t even use them for jobs where they would seem the best tool to use. When I truss a chicken, I’ll usually cut the extra twine with a knife (so I don’t have to wash another implement). I almost never use them to prep vegetables. I don’t like to use them to open packages. Despite my seeming lack of enthusiasm for my kitchen shears, I still manage to use them about 5 times a day, and I’ve worn out a couple pair over the years. I use them to splatchcock chickens, and harvest herbs, and cut lobster shells to extract the meat in large, complete pieces. They can be useful in prepping fish, trimming pectoral fins or even making to initial cut for cleaning. From a travel perspective, the splatchcock technique and the various seafood prep uses ensure that a good pair of shears gets thrown in my travel bag. If you haven’t tried it, splatchcocking a chicken is a great way to reduce the cooking time of a whole chicken in half, while at the same time stabilizing the cooking time and doneness across the various parts of the bird. It’s great whether you are feeding a few or a crowd, and using an unfamiliar grill. I’ll post some recipes and a video of the technique a bit later, and update this post with links. 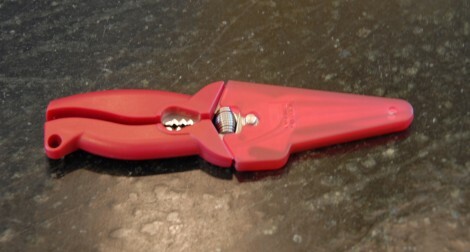 As for the shears, I recently purchased a pair of Kuhn Rikon kitchen shears to evaluate as a travel pair. You may have noticed that I’ve reviewed several Kuhn Rikon products lately. I have no particular love affair with the brand, and certainly no affiliation with the company. The reason their products keep showing up on The Moveable Chef is that they tend to include sheaths or scabbards with their knives and tools (as you can see in the below picture), and the products are inexpensive. I like both of those factors for tools to travels with, at least potentially. I’m reasonably happy with these kitchen shears – the price is right, they are very sturdy, and they are small and pretty light weight. 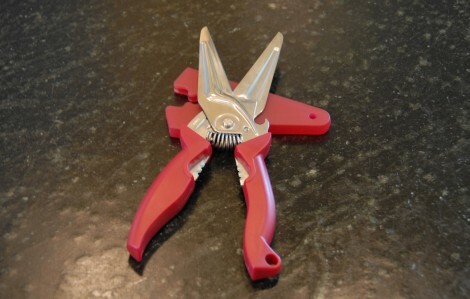 They are straight handled and spring loaded – options that I would not choose for a pair of kitchen shears to keep at home, but which I can compromise on for improved pack-ability. Here is a short video review. By the way, if you get anything out of these videos (information, ideas, a great sense of schadenfreude) please click on the like button, and consider subscribing. As the “channel manager” not even I can see your email addresses or spam you if I wanted to, and I’m pretty sure no one else can see that you ‘liked’ a Whiskey Smash recipe at 2pm on a Tuesday.